One of the problems I have with many of the live-action superhero movies of the past decade or so is how they've gone emo-core or gritty (or both). Tim Burton's Batman movies kicked off the trend of the sombre comic book hero movie, but at least Batman was a more natural fit for that style. Since then, that route has been mostly a case of diminishing returns, and it's mainly the animated films that have given me my classic comic book movie fix. The DC animated features were in “serious” mode, but packed in sufficient thrills and superhero moments in their crisp running times to be worth the while. The Incredibles from Pixar remains the benchmark for the most fun superhero movie I have seen in more than a decade. Megamind is not up to that level but it comes a close second. 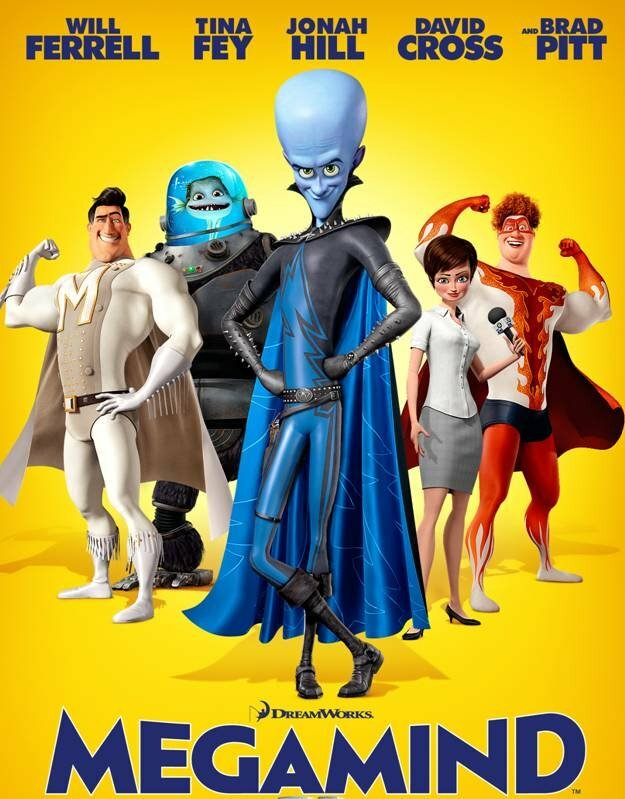 Short of getting an official license, Megamind is the closest is gets to telling a Superman - Lex Luthor story (close enough that I'm sure DC's lawyers must have at least vaguely considered some kind of legal action). The main new trick here is that we see things from the supervillain's point of view. Blasted off from his doomed planet by his parents in a spaceship (sound familiar?) Megamind as a baby crash-lands in a prison, where he learns his rights and wrongs (mostly wrongs). He also finds the world unfriendly to his more obviously alien appearance and nerdy personality (as opposed to his rival Super...Metro Man's hearty All-American Hero avatar). The rejection causes him to discard all attempts to befriend it, paving his way to becoming Metro Man's arch-nemesis. Sure, the plot is borrowed but kudos to Dreamworks for having an actually lucid script that's not just a collection of gags and references. Oh but all of this build-up is just the start of the film, and pretty early on Megamind, much to Metro City's, and particularly, Lois Lane clone Roxanne Ritchie's dismay manages to get rid of the hero. What's a supervillain to do now that he has destroyed his only match forms the interesting and often endearing remainder of the film. The film throws up some lovely possibilities when juxtaposed against the Superman canon – Luthor building another superhero to battle with...and falling in love with Lois, even adopting an alter ego to court her? Hah, interested, aren't you? I won't spoil any more then. In any case, unpredictability is not the strong suit of the movie; it's charm, smile-inducing giddy boyish charm. The voice actors are a big part of the charm – Will Ferrell and Tina Fey totally nail it as the unlikely pair, Jonah Hill as Megamind-generated hero(?) Titan handsomely delivers, and Brad Pitt offers strong support as Metro Man. The setting and style is akin to The Incredibles' brightly colored retro-chic. It works equally well for this film, and the costuming is absolutely gorgeous. And then of course the thrills. The action sequences in the film, in particular the airborne ones, are as good as I have seen in any superhero film. All through I was thinking, THIS is how they should be doing a Superman film, not some dull gritty reboot. Where Megamind falters is in its anxiety to cover all bases. The character of Megamind's minion (called...Minion) is half-hearted in construction and adds a noticeably more child-oriented element to the story. There are also instances where the ambitions of a scene are undercut by the need to place in a recognizable “Hey, it's that one!” soundtrack reference; Ozzy's Crazy Train was a fun addition and Michael Jackson's Bad is justified, but Welcome to The Jungle seemed to have been included only with the idea of passing on cocaine money to Axl Rose. But these are petty niggles. Megamind is a fun and lively superhero movie, and very likely to appeal to pre-Frank Miller era comic book fans. In other words, there's no school like old-school.